In the light of the constant endeavours made by the PUA Field Training Centre to implement the field training scheme set for the academic year 2017-2018 and open new channels of training for PUA students, Prof. Ramadan Abu El- Ala, the Vice President of Community Service and Environment Development Affairs held a meeting with Eng. 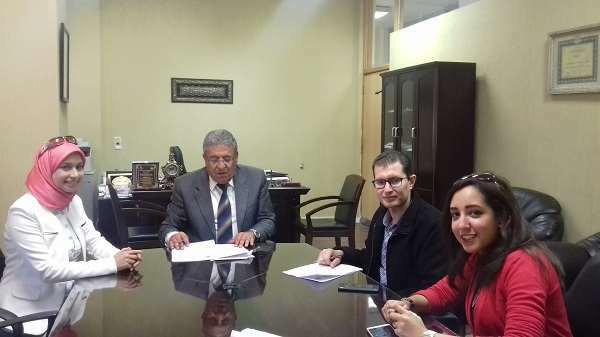 Ahmed Mekawy, the Chairman of Spirula Company for Systems to sign a cooperation protocol. Under the new protocol, new opportunities of training are going to be opened up for the students of the Computer Engineering Department as well as the students of the faculty of Financial and Administrative Sciences. This was held on Wednesday 4/4/2018 in the presence of Dr. Rania Assem, the Deputy Director of the PUA Field Training Centre.